Enjoy ever-changing vistas of white sand beaches, pastel villages, sparkling waterfalls and lush exotic islands rising up from the sea. Whichever exotic itinerary you chose, you’ll set sail in true Mediterranean elegance and style on a journey you will not soon forget at a value you’ll appreciate forever. *Rates are USD, per person, double occupancy, cruise-only valid for new retail bookings only on select sailings and stateroom types for residents of U.S. and Canada. Offer cannot be combined with any other discount or promotion and may be withdrawn without notice. MSC Club Discount can be applied to this promotion. Offer is capacity controlled, subject to availability and restrictions apply. Government taxes and fees for all guests are additional. MSC Cruises reserves the right to pass on any fuel surcharge without notice to all guests. MSC Cruises reserves the right to refuse to honor any prices/sailings that are erroneously printed or quoted. 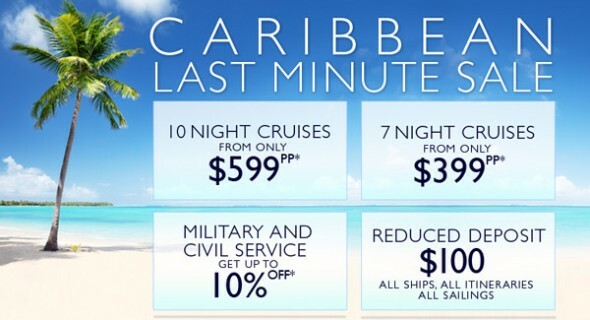 Ask for “LAST MINUTE SALE” promotion when booking. Offer expires December 31 , 2012. Ship’s registry: Panama.